In a system that does not use preemptive multitasking and memory protection, basically any program or subroutine has access to most things in the computer that other ones do too. That is the global environment. A program or subroutine may also have access to certain data, mass-storage buffers, etc. that other programs and subroutines do not. The "inner circle" of features collectively form its local environment, and the typical way to do that on the simple systems we're talking about here is by way of stacks. The very simplest example is pushing processor registers at the beginning of an interrupt-service routine (ISR) so the ISR can use the same registers without interfering with the background task, and restoring the registers at the end. <do_stuff>   ; interfere with other routines' use of the same variables. Other aspects of local variables and environments, especially stack frames and how they can be carried out on a 6502, may be new, but hopefully easy to envision with the groundwork already laid in previous sections of this treatise. It is not necessary to get into operating systems and higher-level languages to find relevance. 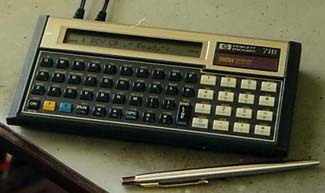 My first experience with going beyond the basics came from my HP-71 hand-held computer (shown at right) which came out in 1983 (and I bought in '87) and was way ahead of its time. It came with by far the best BASIC I've ever seen (especially with the user groups' contributions further improving it). Actually, at the time I took the picture, I was running Forth, not BASIC; but it can hold any number of BASIC programs and subprograms in memory at once, and any of these can call any other subprogram, or even call itself recursively, without stepping on other programs' or subprograms' pending variables, channel numbers, user-defined functions, labels, error-handling setups, etc. which might share names. Data are passed to and from the subprogram in the BASIC line calling it. The number of pending subprograms it can keep environments for is limited only by the amount of available RAM. (I have a total of 177KB of battery-backed RAM in mine, limited by my budget back when RAM was far more expensive than it is today, plus a similar amount of ROM.) When a subprogram is called, the current environment is saved and a new local environment is created for the subprogram. The subprogram has access to the elements of its local environment, plus those of the global environment, but not to those of other pending subprograms' saved local environments. The local environment is erased when the subprogram ends; then the last previous environment becomes active again. At that point, memory taken by the just-closed subprogram's local environment is freed up, and any files associated with local channels are closed, among other things that happen. One place I took advantage of this was in writing a very full-featured text editor. (I do have the video monitor for it, but I wanted an editor that was optimized for using just the small LCD on the computer itself. Having to view your work as if through a keyhole is not nearly as limiting as you might think when that keyhole can be moved around the file quite nimbly.) Since this system (the HP-71) did not offer true multitasking or multithreading, having lots of files open at once did not allow moving from one file to another without either closing one of them (to get back to the last previously opened one) or opening another; but I could have the text editor call itself and use the same program (not another copy of it), and each call had its own set of variables, like which line and column I was on, what block was marked, where the tabs and margins were, what the current print device was, etc., which were part of its environment. I might be working in one file, need to check something in another or copy to or from it (via a cutpaste file that's available to all of them) so I pull that up, and another, and another—and this could go dozens of files deep, although to get back to earlier ones, I had to close files, since the environments were saved on a stack. On a stack, store a backup of the old environment's portions which you plan to re-use, as shown in the initial example above. Then it's ok to use them in place, because you will pull the last previous values off the stack and restore them when you're done. This method has some overhead for opening and closing the environment, but it may be more efficient addressing things while using it, because you can reduce or eliminate indexing and indirection. Start an entirely new environment and keep it on the stack, operating on it in the stack space, knowing that it's temporary; ie, separating the new instead of the old. This method does not move or even temporarily modify older data that will be needed again when you get back to pending routines. Compared to #1 above, it may have has less overhead to open or close the environment, but addressing things in it may be a little less efficient because of the required stack-relative addressing. exit the routine that needed its own environment. PHA          ; at the end.) Their contents don't matter yet. height:  SETL  $103   ; variable is one byte in this case. weight:  SETL  $104   ; Now assign names to the ones passed on the stack. ; sent back to the calling routine in the same bytes. SETL in the C32 assembler is "SET Label," like EQU in most assemblers but you can change the value assigned to a label as many times as you wish. I believe Kowalski's assembler uses .= or .SET . SUB_TOT:   LOCAL  3   ; Make 3-byte local variable SUB_TOT. PRESSURE2: LOCAL  1   ; Make 1-byte local variable PRESSURE2. FLOW2:     LOCAL  2   ; Make 2-byte local variable FLOW2. RTS             ; at the end before exiting. to create local variables on the stack by using PHA's and assign the names for the stack offset (in this case giving FLOW2 the value $101, PRESSURE2 the value $103, and SUB_TOT the value $104), and counting the bytes so the DESTROY_LOCALS macro at the end knows how many to pull off the stack. If you think of a way to do it that would work with most macro assemblers (even if the syntax may need a little modification to work with some), and are willing to share it, please email me, or bring it up on the forum. If I use it, I'll give you credit. Since a label can be assigned new values as many times as you wish (with SETL or .= or similar), and since you put the relevant locals assignments in your source code right before the subroutines that need them, names can be re-used, and the right stack offset value will be used for each subroutine. So for example we could have another routine that has the following locals in the same source code file, and there will be no conflict between FLOW2 below and FLOW2 above. Each subroutine will use the right one. Note that the looping controls presented in section 8 on RPN operations, with source code in Appendix A (StackOps.ASM), are automatically local and nestable. And while you're in a given loop, I puts a copy of the immediate loop index on the data stack, and J puts a copy the loop index of the next nested loop out on the data stack. It doesn't matter how many nested loop or subroutine levels deep you are. (There might be interesting uses for these when you're not in a loop, too. Hmmm...) There may be limitations in how you refer to variables on the hardware stack when you are inside loops that are controlled this way; but this looping-control method is really for use when you're passing data on the ZP data stack anyway, not on the page-1 hardware stack. You might have already noticed that a subroutine can be recursive, which means it can call itself, over and over, and each nesting level of the subroutine has its own variables. The next section, section 15 on recursion, discusses this. Set up a multi-page virtual stack. This would be an auxiliary stack, not a replacement for the main stack(s). Since the 6502's X and Y are only 8-bit, it still won't be practical to go beyond 256 cells on the stack; but at least they can be multi-byte cells; so for example a 2KB space could accommodate 256 cells of up to eight bytes each, and the computer won't care how you use those eight bytes or whether you even use all of them, as long as cells get pushed and pulled as units. It might leave good possibilities open. This is discussed near the end of section 4, on virtual stacks. To free up some page-1 stack space (or ZP, if you're dealing with a ZP data stack), move at least a portion of the "on-hold" occupied stack area to another section of RAM, and reset the stack pointer(s). Move it back when the stack space is freed up. If this is to be re-entrant, the other space will have to be basically a stack too, but you'll only use it for storage, not continual access. This incurs a lot of overhead processor time, but may be worthwhile in some situations. Be careful about how interrupts get handled during the process, so they don't step on data you will need again. Otherwise, it may be possible to put just the address of an array (or other structure) on the stack, rather than putting the whole array on the stack. If you need a separate copy, it can still be made in RAM. Obviously there will be limits. the 6502.org forum topic, "Stack Frames?" the Wikipedia article on "call stack," specifically the section on "structure"
Related to local environments, but not using a stack, is software buffers. These have their own advantages and disadvantages. It's just another tool. One advantage is that they can be bigger than a one-page stack allows—even tens of KB. Another is that they don't have to be a last-on-first-off kind of thing; IOW, you can delete (or even resize) allocated buffers, even ones that are not at the end of the chain. A disadvantage is that it's generally slower, especially if you have to do some memory-moving to prevent fragmentation. An example buffer usage would be to hold a symbol table during assembly on the 6502 computer itself. The table remains for the duration of the assembly process, then gets deleted, possibly after being stored on mass storage. The speed of the assembler is not as important as getting the flexibility you need. The resulting assembled code can be fast; but the onboard assembler that translated the assembly language into machine language doesn't need to be that fast. I recently wrote a set of words to allocate, resize, and delete buffers which would never fragment memory. I was a bit disappointed at how much code it took to do it. The code itself could sure benefit in clarity from a method I have in mind to implement named local variables (including local arrays, which ANS Forth doesn't provide for) in Forth, which again use a buffer. Chicken and egg; but it should be doable. Although the existing code needed almost no debugging to get it going, I still have never before had such a degree of stack gymnastics to deal with! The local variables would clear the air. I may also re-write the material in assembly someday.